In speech to UN, Sheikh Hasina presses Myanmar to allow the return of 'hungry, distressed and hopeless' refugees. Bangladesh's prime minister has accused Myanmar of ethnic cleansing of its Rohingya people and urged the country to allow the return of "hungry, distressed and hopeless" refugees. Sheikh Hasina told the UN General Assembly on Thursday that Bangladesh was sheltering more than 800,000 Rohingya, of whom 430,000 had arrived in the past three weeks. She called for safe zones to be created under UN supervision in Myanmar's Rakhine state. "We are horrified to see that the Myanmar authorities are laying landmines along their stretch of the border to prevent the Rohingya from returning to Myanmar," Hasina said. "These people must be able to return to their homeland in safety, security and dignity." More than half of the displaced Rohingya, a majority-Muslim ethnic group, are living in makeshift camps with little access to shelter, food, clean water and sanitation, according to the International Organization for Migration (IOM). 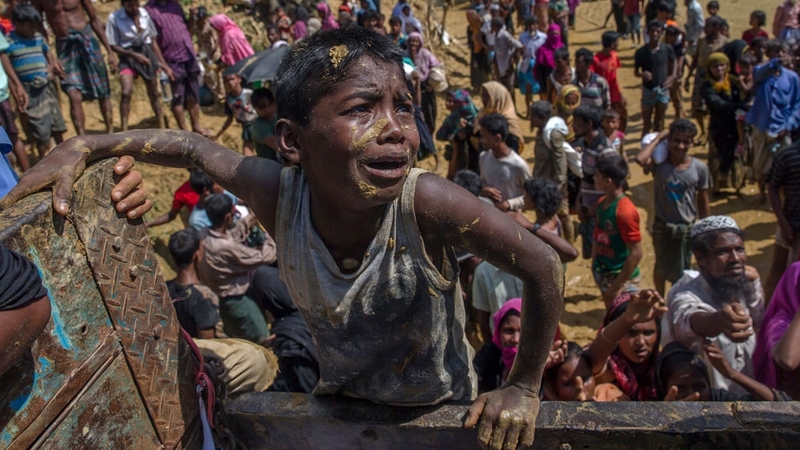 On Tuesday, Marzuki Darusman, the head of the UN Fact-Finding Mission, said they were seeking access to Myanmar to investigate allegations of mass killings and torture. Children make up about 60 percent of more than 420,000 people who have poured in to Bangladesh. They have seen family members killed and homes set on fire. They have known fear. And they have endured dangerous journeys through forests and on rickety boats. Sometimes they have done it alone. UNICEF has so far counted more than 1,400 children who have crossed the border with neither parent. Now they have traded the fear of Rakhine for the chaos of refugee camps in Bangladesh. Tens of thousands of strangers are living in the refugee camps, packed in normally uninhabitable places. Child refugees face many dangers, including separation from their families, trafficking, servitude, and abuse. Hunger is a constant and most children have to beg at some point if they are to eat. And to do that they have to leave their tents. Their parents, who are simply too overwhelmed and impoverished themselves, cannot chaperone them. UNICEF has set up what the agency calls "Child Friendly Spaces" within the camps. These are spaces where children can be around each other, where they can play and sing and have books read to them. In a small room that was built just a week ago in this refugee camp, happy faces abound, with balloons and drawings hung on the walls and ceiling. But the children are all too aware of the terrors they have witnessed, and aid agencies like UNICEF and Doctors Without Borders (MSF) say they are barely scratching the surface when it comes to addressing their mental and physical well-being. The aid agency Save the Children warns that more than 600,000 Rohingya children could be in Bangladesh by the end of the year. Many of them will probably be orphans who will need urgent assistance.